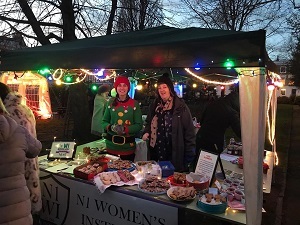 December 9th saw N1 WI members brave the cold at Arlington Square Christmas Fair to sell cakes, biscuits, and plenty of mince pies. The fair was raising money for Pack Up, the weekly soup kitchen that meets in our hall, and managed to make a massive £1,000 for this great cause in just an hour and a half. The fair has carol singing and mulled wine and lots of other things for sale so it’s definitely worth checking out next year! On the same day, we also had a craft stall at Union Chapel’s Christmas Craft Fair, selling lots of things handmade by various N1 members, including jams and chutneys, crocheted Christmas decorations, paper quilled gift tags, and more. We also had information about our WI available and Anna did excellent work demonstrating some crafts. It was a busy but very successful day all round! We’ll be doing more stalls again in the summer – if you have any suggestions please get in touch!